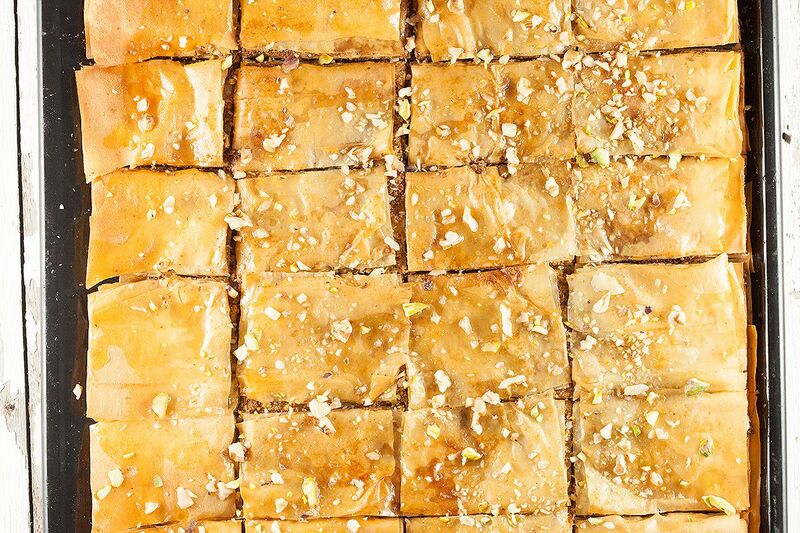 Make your own delicious baklava right at home. It's super sweet, goes well with a nice hot cup of tea. Recipe for ten people. Having trouble converting European measurements to American? Click here for our measurement conversion table. PRE-HEAT your oven to a temperature of 160 degrees celsius (320 fahrenheit). FINELY chop 150 gram pistachios and 150 gram walnuts. SAVE about 2 tablespoons of chopped pistachios for garnishing later on. Grab the large baking tray and mix the chopped nuts together. Add zest from one lemon over the mixed nuts. ADD 60 grams of refined sugar and 1 teaspoon of cinnamon powder. MIX together and place inside the pre-heated oven while you prepare the sugar-coating. MELT 150 gram dairy butter using the small saucepan, make sure that the butter doesn’t burn, so heat it using the lowest setting on your stove. REMOVE the baked nut mixture from the oven, and turn the temperature up to 200 degrees celsius (392 fahrenheit). TRANSFER the baked nuts to the medium-sized bowl, and let cool off to room temperature. GREASE the baking tray using the melted butter and a silicone brush. ADD two layers of dough to the baking tray. (from now on grease each layer with the melted butter). DIVIDE some of the nut mixture over the dough. REPEAT four times, until all of the nut mixture has been used. In short: two layers first, grease with butter and add some of the mixed nuts over, repeat four times. DIVIDE remaining melted butter over the top layer. 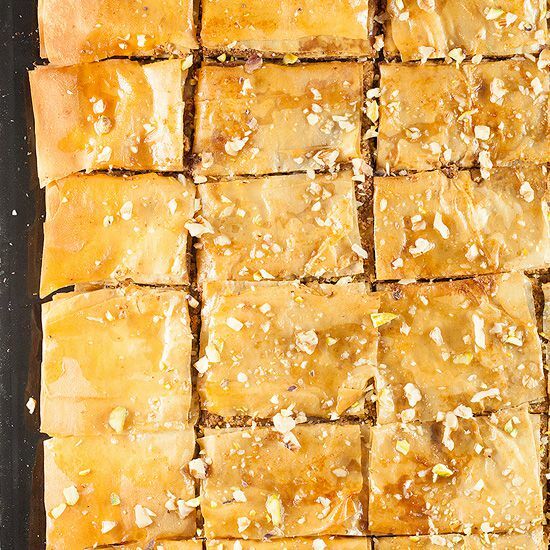 SLICE the baklava into rectangles, squares or any other bite-sized shape you’d like. This can be a bit tricky, since the dough is very fragile. BAKE the baklava in the pre-heated oven for 40 minutes, or until golden brown. Total baking time can change depending on what kind of oven you are using. 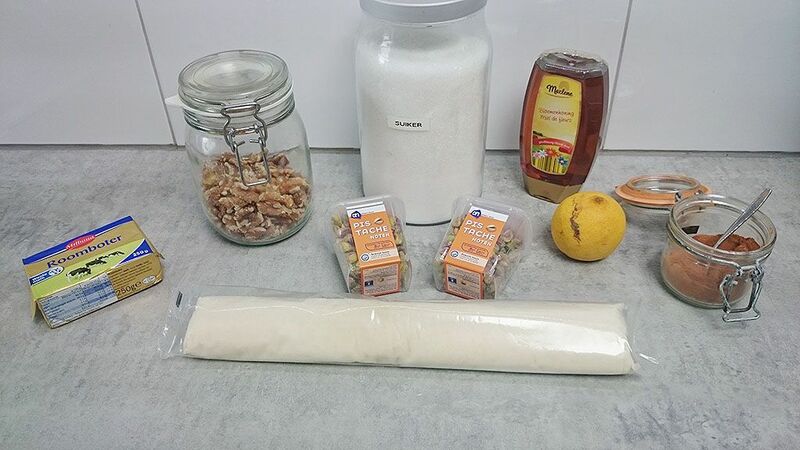 So, keep the baklava in mind when making the honey sirup. The best part of a baklava is the honey sirup. It’s what gives the dish it’s super sweet flavors. SQUEEZE juice from 1 lemon into the small saucepan we’ve used before. ADD 75 grams of honey, 150 grams refined sugar, 1 teaspoon of cinnamon powder and 150 grams water into the small saucepan. Turn the heat up to medium and let simmer for about 15 minutes. Check on the baklava, remove if golden brown. REMOVE the baklava from the oven and pour over the honey sirup using a large (soup) spoon. DRIZZLE between each square, coat it evenly. DIVIDE remaining pistachios over the dish, serve immediately or refrigerate in a sealed container for up to two days tops. Enjoy! Lovely version. I grew up just using walnuts but the pistachios are a nice addition.